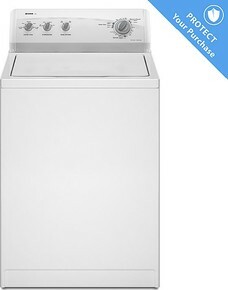 The Kenmore White 500 3.5 cu. ft. Top-Load Washing Machine (2952) is designed to fit any lifestyle. There are many customizable features that make this possible. The durable washing machine conserves energy, provides options for fast wash and provides dependable cleaning for delicate fabrics. The Kenmore White 500 3.5 cu. Ft. Top-load washing machine (2952) makes use of Dual Action Plus Agitator for its washing motions. The washing machine has five water levels. It has five wash cycles to choose from: stain treatment, daily wash, prewash, extra rinse and energy saver. The 2952 washing machine also has several standard and special cycles. The standard cycles include delicate, heavy duty, normal, whites and permanent press. It only has one special cycle: the express wash, which is good for emergencies. The Kenmore 2952 model operates quietly and with minimal vibration. It has a pretty good laundry capacity, being able to accommodate a cycle the equivalent of 16 bath towels. It can clean small loads in 24 minutes. It makes use of the Automatic Temperature Control (ATC), which ensures consistent temperature during the cycle. It has a Second Rinse feature, which helps in removing all the detergent from the garments. This is great for those with sensitive skin. The 2952 top-load washing machine has rotary controls. The tub basket is white. The control panel has a white metallic color. The washing machine has a child-safety lockout. It has a display that shows the estimated time remaining and the cycle status. It has a dispenser for each of the following liquids: prewash detergent, detergent, fabric softener and bleach. The top and lid material is powder-coated. The wash basket is made of porcelain. The washing machine comes with fill and drain hoses. The Kenmore 2952 washing machine model is the laundry helper for the person on the go. Consumers who want to be able to wash a few pieces in a fraction of the usual cycle duration will be happy with the 2952. The washing machine is also great for people with sensitive skin as it makes sure that excess detergent is removed completely. Its size can fit into most rooms without any problem and accommodates enough clothes for such size. Users may complain about the fact that the Kenmore 2952 is not designed with sophistication as most modern washing machine models. The control is rotary-style and it does not even comply with Energy Star and NSF requirements. Do not buy, You have been warned!!! WHEN I BOUGHT THE WASHER IT WAS WORKING FINE AFTER THE WARANTEE EXPIRED IT BROKE DOWN WE HAD TO PAY FOR THE TECHNICIAN.NOW OUR CLOTHES ARE BEEN RIPPED APART WHEN DOES IT END AT ONE TIME KENMORE WAS ONE OF THE BEST TO BUY NOW I WOULD NOT BUY ANOTHER ONE EVER AGAIN. Our Kenmore washer broke after 3 years. After less than a year it kept getting off cycle. We called and they taught us how to reset the machine. Now, the washer will not reset and we can't do laundry because it will not drain. I guess our warranty expired after 2.5 years (which seems odd to me, but that's what they told us), and neither Sears nor Kenmore will help us fix it or get a discount on a new washer. Our last washer was nearly 25 years old when it died, so 3 years was a huge disappointment. I bought the set and after 1 1/2 years the washer started to act up, in that it stopping brake failed and just make an ugly noise. finally now after 4 years there is no spin. Off to the recyle. REeently purchased one. nearly impossible to balance a load, has no off balance shutoff, so drum smashes around, bearings wont last long, very noisy. actually rolls dirt and hair into balls and leaves it in clothing. very poor machine over all. i'm giving it away to thrift shop and putting a new timer in my 30 year old maytag, far superior machine.